I got the lenses in a solid cartoon case with the brand's logo, so you're sure your lenses won't be damaged during the travel! I also got an adorable animal case, it's super cute and it's also useful when you have to recognize your lenses! As you can see in the picture the lenses are really gold/brown and it was the thing I wanted the most! I really love the effect the lenses give to my eyes, the perfect gold effect I was searching for! They also have a good enlargement, even if they are only 14 mm and they're also really comfy. 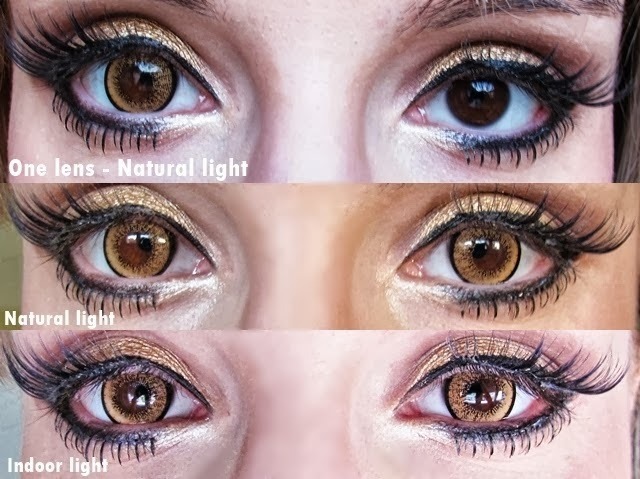 The color blends really well with my natural eye color, I think they're perfect on brown eyes, maybe on light eyes the effect will be more yellow and unnatural. They're also available with prescription for myopic people like me! Color 5/5: they have the perfect gold color, I love it! Design 4/5: the design is really simple but perfect for the final effect. Enlargement 5/5: they give a good enlargement also if the diameter is small! This is the last lenses review for now, I hope you like it! Let me know what you think about it and if you tried these lenses! wow, they are so pretty :) it's such a natural colour. Yes, the color is adorable, I love it!